Sneaks continues to bulldoze genre barriers on their latest album. Hailing from Washington D.C., home to a surprisingly vibrant experimental music scene, comes Eva Moolchan’s solo project: Sneaks. Sneaks pushes beyond conventional boxes, mixing synth tracks with spoken chants and mantras alongside a conglomeration of house tempos and post-punk beats. While it’s only been six months since her last release, Gymnastics, the wait for It’s a Myth has felt like eternity. In an age when taking chances could make or break one’s career, very few artists make the high stakes jump. 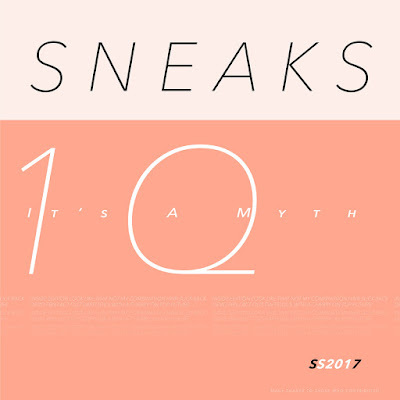 For Sneaks, these leaps of faith are as easy and common as a twenty second synth interval between two songs on It's a Myth. Her minimalism, however, remains a constant throughout the album. Despite the fluctuation in soundscapes that takes place within It’s a Myth, it's never overwhelming or sporadic. Instead, the mixed bags of sounds upholds Moolchan’s fast-paced eclectic sound that was present in Gymnastics as well. While that release revolved more around her spoken word process, It’s a Myth delves deeper into the process of repetitive synth samples. Each song exists in its own sound galaxy, combining highs and lows in crisp, innovative ways. But the dynamism in It’s a Myth is its ability to come off cohesively without following a specific pattern. Listeners are forced to relinquish control to Moolchan as she leads us through her various galactic soundscapes. Sneaks’ persistent shift in tone and beat packs a punch within its running time of eighteen minutes. It’s a Myth breaks barriers in its daring and versatile sound. With this album, Moolchan reminds us all that experimentation can lead to an intoxicating freshness—one that we should all strive for. Listen to Sneaks on bandcamp.